Why test for food intolerance? Food intolerance occurs with the foods you eat most often. Most people are unaware that they are eating foods that make them sick. IgG reactions are much more common than IgE reactions, affecting as many as 1/3 of the general population. IgG reactions that cause food intolerance take hours to days to develop; making them very difficult to uncover without testing. More than 100 diseases and conditions are associated with food intolerance. More than 2/3 of people with chronic health conditions have IgG reactions to food. Why have IgG test done? To uncover food allergies to resolve current symptoms or to prevent hidden chronic inflammation from developing into systemic disease. This tests from 96 foods including meat, fish, dairy, grains, vegetables, and fruit. You will receive a full report of the 96 foods testing positive or negative for food allergy/ sensitivities. 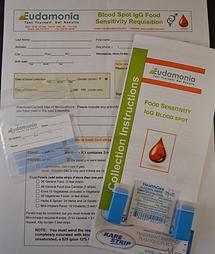 The kit contains Collection instructions, test requisition form, 3 blood collection strips, 2 auto lancing devices, 1 alcohol swab, 1 plastic bandage, re-sealable plastic bag, pre-paid XpressPost mailer. Results take approimately 10 business days from the time the lab receives the kit. A copy of your results are emailed to you as a pdf and/or a paper copy can be mailed to you at your request. 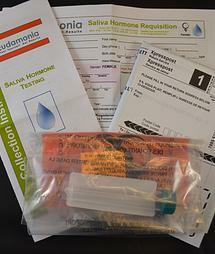 What are the benefits of saliva hormone testing? Saliva hormone testing is most useful for uncovering hormone imbalance. For example: discovering a woman has insufficient progesterone to balance high estradiol levels or; that high cortisol levels are interfering with the action of progesterone and testosterone. Once a hormone imbalance has been uncovered, nutritional therapy can be instituted. Saliva testing can also be used to approximate whether hormone levels are too high or too low as a result of supplementation, but the actual dosage adjustment will still be symptom driven. In other words, if hormone levels are above range, a dosage reduction may be indicated, but the practitioner must make his or her best estimation as to the dosage adjustment needed, and carefully monitor patient symptoms to ensure that adjustments are reasonable. Saliva collection is painless and more convenient for the patient, particularly when multiple samples are required.